If you're looking for a new way or perhaps a whole new different perspective on the usual boring dim sum, Way Modern Chinois Restaurant might just be the perfect choice for you. 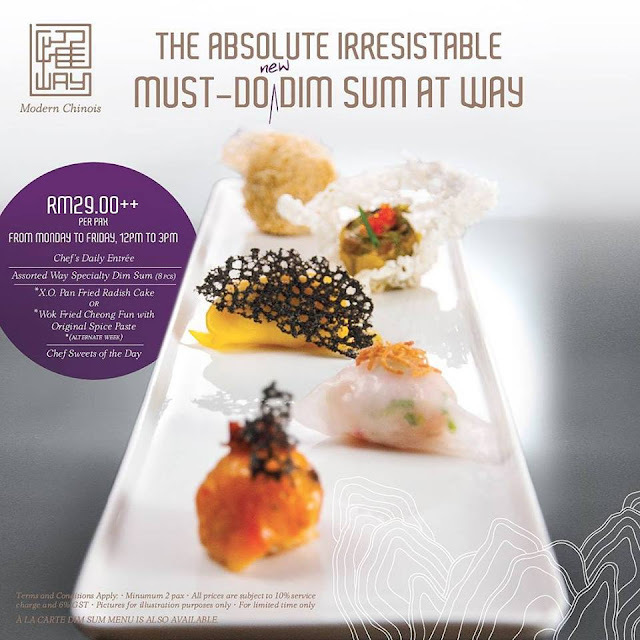 Located at Clearwater Damansara Heights (right next to PLOY), and just a few blocks away from the Istana Negara entrance, Way Modern Chinois is a modern, classy, elegant and refined restaurant offering contemporary Chinese cuisine. Believe it or not, this is actually the entrance to Way Modern Chinois restaurant. Quite fancy. The interior along with some of the cutleries. We started off with a delicious spoonful of their signature Skinless Shanghai Soup Dumpling. Not only does it look amazing, it tasted really well balanced as well. The texture of the "skinless" part was very interesting as well. It literally pops upon placing it in my mouth. Loved the fragrant and well-seasoned broth along with the ginger foam and squid ink flat dough on top. This is taking Siew Loong Bao to a whole new level. Aesthetically, it looks amazing. Loved how the crispy squid ink web was placed onto the dumpling itself. The Crab roe was well balanced and seasoned, wrapped tightly in a firm but soft dough and finally sprinkled with some spring onion and of course, the web on top. Though it was quite unfortunate that the squid ink web didn't provide much flavour and only texture. To be fair, I had a much higher expectation for their char siew pao. Unfortunately, the flavour of the char siew itself did not deliver. The chef insisted on a balance between the char diew and the coriander bun, which was thoughtful but it didn't end as well for me. I still prefer my char siew to pack a punch and the bun to be soft and fluffy. I actually thought they were pretty well made and plated. Looked like a fortune bag with plenty of gold inside. Stuffed with chicken and chives, wrapped and fried till crispy perfection and served on a bed of wasabi mayo. Each element worked well with one another, provided if anyone can fit one right in your mouth. If not, it might be quite a mess. This was actually one of my favourite. The bean curd was fried to golden perfection, making it extremely crispy and light. The fillings which were prawns, were fresh, plump and full of flavour. It was quite a treat. Beautifully presented and packed with flavour. Each strip of Wok Fried Cheong was consistently chewy, with a crisp exterior and a spicy glaze. As with most dim sum restaurants, a form of glutinous rice is recommended. Way Modern Chinois's version has duck as compared to typical chicken. However, I find the lack of seasoning and flavour to be quite disappointing. Crab claw and prawns beautifully wrapped in a consistently firm but soft dumpling dough. Very fresh and had a decent and well balanced flavour. This actually looks like a blackened siew loong bao, which isn't a bad thing. The truffle crab soup was packed with flavour and will explode upon eating. The dumpling was firm and it carried the whole thing nicely. Perfect for those who are bad with chopsticks. Despite the cute and rather interesting presentation, the taste of it was slightly on the saltier side. It had a nice consistency though, along with some crunch added on top. This was actually a pretty interesting dish. I liked how the exterior resembles a nest, and even feels like one upon eating. The only thing I didn't like about it was the thickness of the mashed potato inside. The ratio between that and the seafood curry was off balance. If the seafood curry had a bit more flavour, or perhaps even spicier, then it might work. However, I found it to be quite disturbing. Apart from the sticky rice which I didn't really like, the lamb was ridiculously good. It had a nice distinct aroma and flavour, which was very pleasant to the palette. Good flavour but could use a little more work with the rice. Our final dish, which is called "Fish & Chips" literally is what it is. Do not be fooled by the appearance as internally, it worked like one. The skin is coated with a beautiful vinegar powder, which gave it its acidity and saltiness. Inside, was a thick layer of mash potato (which acted as the "chips") and finally in the center of it, was cod fish. However, despite the amazing flavour and technique used to make it, I found that the "chips" part of the dish to be a little thick. I can't feel much of the fish, which was quite sad since it's a delicious and silky piece of cod. Hopefully the chef will improve this in the near future as I see quite a prospect for it. In conclusion, I felt that Way Modern Chinois Restaurant certainly was a level above the rest. The dishes served, especially the Skinless Shanghai Soup Dumpling, was ingenious. Loved the balance of flavour and the unique texture. Though there are some of the dishes that may require some re-work, a fraction of them were very good. It's new, it's fresh and it's definitely worth a try. For those who are freaked out by the price, Way Modern Chinois is currently having a promotion for only RM29.90 per person. It includes an appetizer, 8 individual pieces of dim sum, a choice between XO Pan Fried Radish Cake or Wok Fried Cheong Fun with Original Spice Paste and a dessert of the day. Truly affordable!